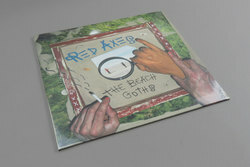 Red Axes - The Beach Goths. Vinyl LP. Bleep. The Tel Aviv psych-rockers return with their second LP, out via their own Garzen imprint. Yoking together psychedelia, desert rock and the groovier end of post-punk, Red Axes make a racket not unlike Goat. Furthermore, they combine sonic exploration with tight pop songwriting skills in a manner also much like the Swedish group. Tracks like ‘Tantram Power’ and ‘Cooked Banana’ blossom from freaky-deaky intros into sweet pop songs in the Grateful Dead mould. Elsewhere the rhythms take centre stage - check the motorik pulse of ‘Piper Work’. And on tracks like the helter-skelter ‘Talmood’, they’re not afraid to go full freakout.